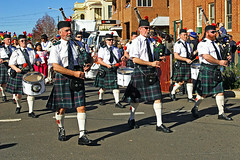 The 2008 Grenfell Henry Lawson Festival of Arts was held at its traditional time of the Queen's Birthday long weekend in June. 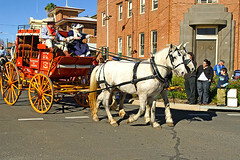 The street procession is a festival highlight, with locals coming out in droves to participate and witness this colourful event. 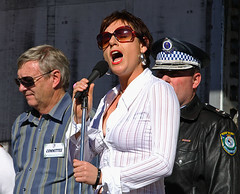 Before the procession commenced, the Australian National Anthem was sung by Christa Hughes. Here's a collection of images I took on Saturday June 7, 2008. 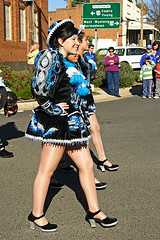 Please note that all images are available for sale and licensing for promotional activities. I can be contacted by email and phone. Click here for contact details. 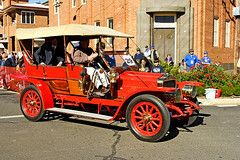 Click on each image to view larger sizes. 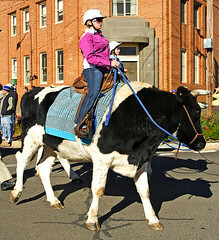 A slideshow of street procession images can be viewed by clicking here. A photograph of yours truly holding the bronze statuette award for winning the 2008 Grenfell Henry Lawson Festival of Arts Best Photograph of the Exhibition. The winning photograph is 'Dog Rocks'. 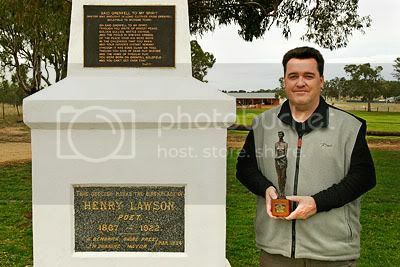 Darren Stones holding the bronze statuette known as the "Drover's Wife"
This photograph was taken by my father Gordon Stones at the Henry Lawson Obelisk at Grenfell, New South Wales, Australia during the 2008 festival, which was held during the Queen’s Birthday long weekend in June. 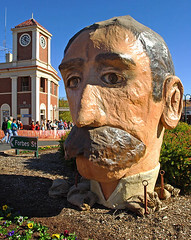 The obelisk marks the birthplace of famous Australian poet Henry Lawson. Thank you to all the marvellous people I had the pleasure of meeting, chatting and dining with during the festival.